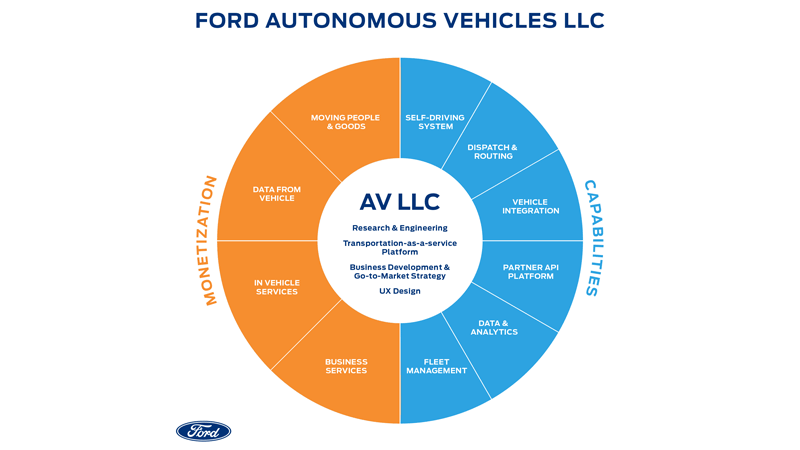 Ford Motor Company announced that it has created Ford Autonomous Vehicles LLC, a new organization charged with accelerating its autonomous vehicle (AV) business to capitalize on market opportunities. The company also detailed key organizational changes designed to improve its operational fitness and drive profitable growth. The new LLC, which is structured to take on third-party investment, will be primarily based at Ford’s Corktown campus in Detroit and will hold Ford’s ownership stake in Argo AI, the company’s Pittsburgh-based partner for self-driving system development. Ford expects to invest USD 4 billion in its AV efforts through 2023, including its USD 1 billion investment in Argo AI. Sherif Marakby, currently Ford vice president, Autonomous Vehicles and Electrification, has been appointed CEO of Ford Autonomous Vehicles LLC reporting to a board of directors chaired by Marcy Klevorn, Ford’s executive vice president and president, Mobility. The closer alignment of the self-driving platform and the mobility solutions teams will allow faster development of businesses that can thrive in the pre- and post-autonomous vehicle worlds. Ford’s electric vehicle strategy includes rethinking the ownership experience, including making charging an effortless experience at home and on the road, as well as offering full-vehicle-over-the-air software updates to enhance capability and features. In addition, Ford is reorganizing its Global Operations division led by Executive Vice President Joe Hinrichs to include Information Technology as well as the company’s global order to delivery system, integrating the teams, technologies and processes from both across Ford’s production system. As a result, Jeff Lemmer, vice president and CIO, will report to Hinrichs. Hau ThaiTang, executive vice president, Product Development and Purchasing, will now report directly to Hackett. Under ThaiTang, Ford is moving to flexible vehicle architectures and more common parts across models, cutting new product development time – from sketch to dealer showroom – by 20%. This is helping Ford achieve its commitment to deliver nearly USD 7 billion of engineering efficiencies. The company intends to have the most efficient Product Development organization among full-line automakers within five years. Ford’s five flexible vehicle architectures – body-on-frame, front wheel drive unibody, rear wheel drive unibody, commercial van unibody and BEV – are paired with module “families” that address the power pack, electrical pack and vehicle configurations. 70% of each vehicle’s engineering will be driven from this new architecture approach, with 30% of content – including grilles, hoods, doors and more – customized for each vehicle. All organization change are effective 1 August 2018. Additionally, Ford is embedding a deeper product line focus across the company. Led by Jim Farley, the effort is anchored on human-centered design with product line teams putting greater emphasis on customer insights and market opportunities to deliver more consumer-driven products and services. This customer-focused product line approach builds on the success already seen throughout Ford with the F-Series team in North America, the Ranger team in Asia Pacific and the Commercial Vehicle team in Europe.